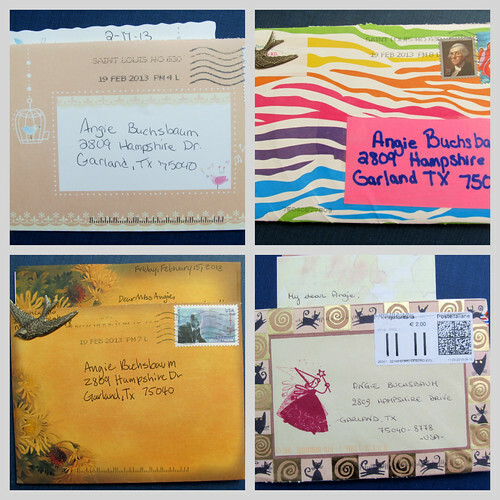 Mailbox Happiness: Has Your Writing Changed During LetterMo? I've met many new people during this run. but writing is easier now and I feel more secure. When I arrived at a conscious state this morning, cold air was the first thing I noticed, reminding me that I forgot to turn on the heat last night. Staying in bed was my first choice but my sweet little pup Primrose was just happy I was awake and she wanted to start the day. I managed to drag myself out of the snuggly warmth of my bed and headed straight for the heater...turned it on! Next stop, kitchen for hot tea and breakfast for Prim. She's so happy in the morning's she literally bounces sideways, really a cute sight to see. No more pressure to write a certain way or try to be interesting enough, I just write and hope it's received well on the other side. Has your writing changed during LetterMo? Did you start out one way and end up another? Are you more comfortable now? Do you think the connections you've made will last beyond February? Lovely mail arrival from the USA & Italy. I am enjoying this Month of Letters and I am a little more comfortable with my awkward first letter most of the time, but now and then my mind just goes blank and I revert to the boring and dreaded "letter of introduction". I plan to continue into March and maybe April, I have more people I want to write to and I do hope to make some long term connections this month. 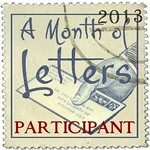 I have enjoyed this Month of Letters. I think my letters have improved over the month. I started writing more about my day with some information about me mixed in. I hope to continue writing to some of the people I have received letters from. I have found several friends with similiar interests. Wow, I love your opening paragraph. I would be thrilled to read that introduction. I'm not sure my writing has improved that much. It looks like you've been getting some colorful mail too. Enjoy your day! Wow what pretty mail you receive I shall call it happy mail . so nice and always so colorful . I don't know that my letters are any better now then at the beginning of the month. I tend to start off just like I do in real life, kind of quiet and holding back until I get to know the other person and what they are like before I'm able to become more comfortable. Always wondering how I'll be perceived or worried that I may offend someone with a comment or joke. I'm hoping some of the connections I've made will last far beyond this month. That is if I wasn't too boring to start out with! I don't think my writing has changed this month but it's definitely different from last year. I tried to talk about only one topic last year and now I write about what happened to me that day or my plans for the upcoming week along with questions to invite an ongoing dialogue.